Greensky Bluegrass is in Pittsburgh tonight! 'Our genre is Greensky,' they told Ryan Smith. They're right on -- and very much worth checking out. 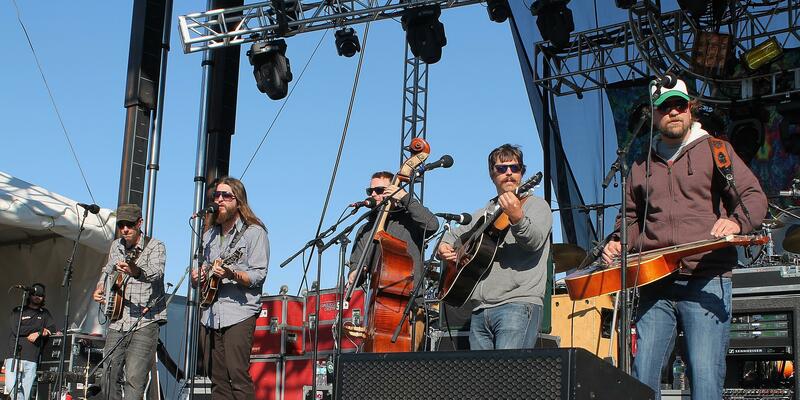 After the sun sets on Pittsburgh tonight, look for Greensky Bluegrass. The Kalamazoo, Mich.-based quintet -- masterful string players, well-known to thousands of fans of jam, bluegrass, Americana, indie, roots-rock, country and, well, music worth putting into your ears -- takes the stage at the stately Rex Theater this evening in support of their phenomenal new album, "If Sorrows Swim," which debuted last week at #1 on Billboard's charts for new bluegrass. The band, which I've had the pleasure of catching a few good (I mean, goood) times in recent years, goes non-stop on the live scene, usually touring across the country around six of every week's seven nights. And, wherever they go -- from the stage at the Dark Star Jubilee and countless other northeast-based music festivals to Colorado's Red Rocks Amphitheater, Nashville and other points west -- crowds keep going too, and growing, too. They're hellaciously hard-working, to be sure. And beyond busy out there on the road, no doubt. But, before tonight's stop in Pittsburgh, a couple of the Greensky guys -- bassist/vocalist Mike Devol and dobro player Anders Beck -- took some time for a quick chat with the Reader. Ryan Smith: I've been enjoying you guys' work for a good few years now, and especially so after you totally blew my mind at the Dark Star Jubilee in 2013. So, thanks for what you do! And, man, the new album -- it's just phenomenal. It sure seems to come from places of sorrow, in some ways, but not of places void of hope. I dunno, it seems weary, I suppose, but not despairing. Now, I know time's short, so just share some words on the places (real, imagined or otherwise) that this piece of fine work has come from. And, beyond that, talk a little about the places your work in general is taking you -- and, yunno, anything else you'd like to add. Anders Beck: "While it may sound sort of obvious, our goal with 'If Sorrows Swim' was to make a great album. As musicians, the albums we make are our calling cards, and they never fade away -- especially in this digital age where nothing ever disappears. I'm very proud of our last album, 'Handguns,' and I think we've made a great follow-up to that one. Greensky is pretty well known as a live band, but the album side of things is equally important to us, as a sort of juxtaposition to our live shows. When we create songs, typically, Paul [Hoffman, vocals/mandolin] or Dave brings a song that they have written to the band. It's usually pretty well fleshed out as lyrics and melody and chords. From there, we 'Greensky' it, and build it into something bigger that works with all of us. Sometimes there are big changes, and sometimes not. Sometimes it's quick, and sometimes it takes forever. Sometimes it's pretty fun, and sometimes it's incredibly frustrating. I'd also like to add that the more I see people try and pigeonhole what we do into a genre, the more i think that it is impossible. We are ourselves. Our genre is Greensky. We're not trying to be like anything, or trying to be different than anything -- we're an amalgamation of all of our musical influences. I love bluegrass, but i also love Phish, and Eminem, and John Coltrane. Our music sounds like us, and while that sounds really obvious, I think it's pretty cool that we have carved out our own niche with these five instruments, a bunch of voices, melodies, and words. Mike Devol: "Since we've played some of the tunes on the album out live for a year or more, many listeners will recognize several of the songs on the disc, but a few haven't been played for a live audience at all. It's funny to record an album and then wait to play the songs live, because when you decide that it's time, you have to go back and remind yourself how they go. A number of the new songs were developed only a few days before we went into the studio and laid them out. We've spent countless hours since listening to them, but the playing was crammed only into these few days last winter. [And] now, as we prepare to go play them for people, we find ourselves learning them from the recording we made." To get in on the experience tonight, just visit the Rex Theater's website for tickets, directions, and other useful info. And check here for details on other fall tour stops, the new album, older albums and everything else Greensky Bluegrass. You can reach Reader writer/photographer/genre-bending music fan Ryan Smith at rsmith@eriereader.com, and follow him on Twitter @ryanmsmithplens.